New Orleans’ brass band tradition, rooted in the 19th century, took on new life toward the end of the 20th. The Dirty Dozen Brass Band began incorporating bebop, R&B, and funk into their style, bringing a new sound to the streets. The Rebirth Brass Band followed in their footsteps and added hip-hop to the mix. By the 1990s, a new generation of bands and social aid and pleasure clubs led a second line renaissance. 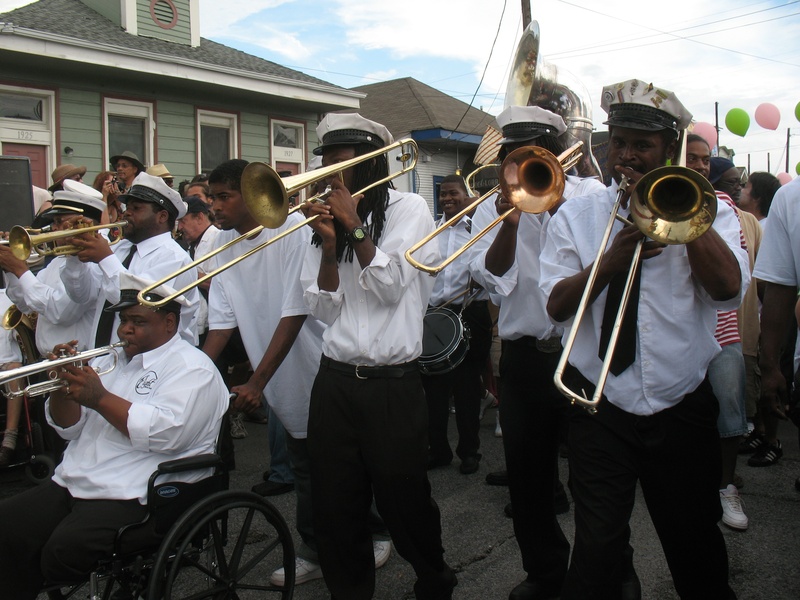 The brass band boom continued after Hurricane Katrina in 2005, despite musicians’ and club members’ displacement from neighborhoods like Treme that had been its historic incubators. 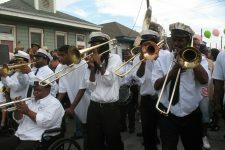 Members of the Hot 8 Brass Band, including Terrell "Burger" Batiste in wheelchair at left and Keith "Wolf" Anderson at far right play in traditional black and white uniforms for the Black Men of Labor Social Aid & Pleasure Club second line parade in 2009. Wikimedia Commons. Photo by Marie Carianna.